Are you putting short-term returns before your long-term goals? Depending on your personal goals, investments can be divided into two types - short-term and long-term. Depending on your personal goals, investments can be divided into two types - short-term and long-term. If you have clear goals in your mind and access to a financial advisor, you can choose the right investment at the right time. Both short-term and long-term investments have their own advantages and disadvantages. 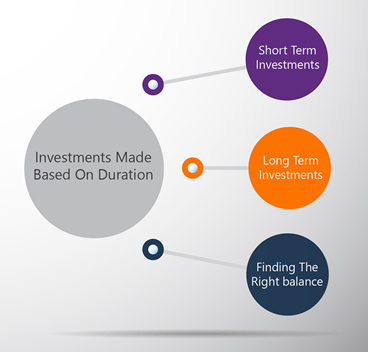 Short-term investments can be defined as those instruments in which you stay invested over a period of one year or less. These investments usually serve the purpose of protection of the principal amount invested. They are debt instruments which have very less or no risk. Good examples would be corporate deposits, money market instruments, etc. They can be used if you know that you will need a certain amount of money over a short period. In case you need funds for marriage or buying a vehicle, short-term investments make sense. Trading in the stock market can also be termed as a short-term investment where one can stay invested for minutes, hours, days, or months. However, it is important to understand the stock market thoroughly before indulging in short-term capital investments as the risk involved is high. One also has to be able to monitor stocks on a regular basis. Long-term investments are those investments in which you stay invested over a very long period of time. For definition purposes, the term of investment is more than a year. But long-term investments are usually made with an idea of gaining returns. This is possible only if you remain invested for a long period. One can gain from investing in stocks over an extended period and increase considerably if the company is doing well. To mitigate risks one must choose a bunch of different equity stocks which have a history of good performance and be invested over an extended period. One must not sell these stocks when there is a downfall. This will cause loss of the principal invested. The loss will be made up for by the stock once the index starts improving. These investments are usually considered for saving for long-term plans. Investors invest in these instruments to fund their long-term goals like retirement or buying a home or funding an education. Short-term gains may tempt many investors that the stock market can give. But one must be careful as the stock market can be volatile and risky. One must always have a financial plan in place; depending on their goals, they must balance their short and long-term investments. He should also have separate funds for these investments. These funds should not put him at risk, and he should be able to withstand in case he loses this money.